Steam Train Hotel, Antonito, Colorado. Open year round! Enjoy a laid-back, relaxing vacation! Clean, Comfortable & Convenient and open all year. 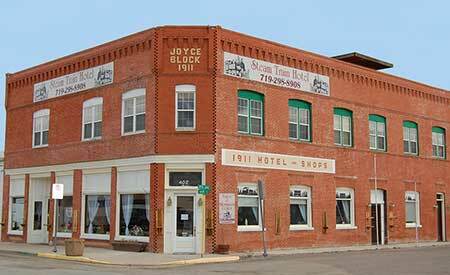 The Steam Train Hotel in Antonito, Colorado, is located just 3 minutes from the Cumbres & Toltec Train Depot. The Hotel with an Inn Touch! You are sure to find a room that you will enjoy staying in at our historic hotel. There are even two rooms that are reputed to be haunted. Ask if you are so inclined! The Cumbres & Toltec 2017 Season opens May 27. Book now! We put cleanliness first. That includes all the TV remotes and bedspreads! Clean, every time. Charming, unique rooms with new bathrooms, new electricity, cable TV and Internet, and a wide variety of room configurations. You may pick among rooms with single beds to suites with kitchenettes. Comfortable beds. Be sure to schedule a wakeup call so you don't oversleep. Many of our guests tell us that our beds are as comfortable, or more comfortable, than their beds at home. A convenient location. Especially for train buffs. The Cumbres & Toltec depot is only three minutes from the hotel. Beautiful setting with 360 degree mountain views, cool temperatures and no humidity. Enjoy our gorgeous weather and great sunrises and sunsets upstairs on our rooftop relaxation deck. Plenty to do in the surrounding area. Tell us your interests, we can help you plan a great trip! A knowledgeable staff. Browse our local reference library to find out more about the area. We can help you arrange a perfect get-away in our quaint little town. Our goal is simple. We want you to have the best possible experience when you stay at the Steam Train Hotel! We recently received an award of excellence from bookings.com too! Karen L said, "I absolutely love this place. Staff make you feel special and welcome. The cook is awesome. I will be booking all my stays with the Steam Train Hotel. The jet tub in our room was the most amazing and relaxing part of my day. I did not want to leave."